On January 14, 2011, the governor’s office notified the staff of the Arizona Department of Mines and Mineral Resources that the department would be permanently closed. The staff was given until Jan 21st to close down the department and remove their personal items. The notice was a surprise, and there was no discussion about what would happen to the departments vast mine records, files, and references. Despite running a state known as one of the world’s richest copper mining regions, Arizona’s governor eliminated the Department of Miners and Mineral Resources, which closed its doors Friday. In a move that could only be described as asinine, the Arizona Governor’s office has ordered the closure of the Arizona Department of Mines and Mineral Resources. We certainly understand the need for state governments to trim waste in these difficult times, but why the state would close one of the only agencies that helps generate income and create jobs is beyond imagination. The truth is that the Governor’s action had nothing to do with cost cutting. Far from it. The real reason is that the Governor wanted the mineral museum building for her new boondoggle, the Arizona Centennial Museum. She is not saving any money. She is wasting millions. In 2010, the Governor transferred the building (which housed both the department and the mineral museum) and most of the mining department’s budget to the Arizona Historical Society. The mining department did not have enough money left for the entire fiscal year. When the department then ran out of funds, the Governor fired the staff. It was the final step in grabbing the building for her new boondoggle. The Governor’s actions were so remarkably irresponsible that she fired two people whose salary was paid by grants. At the last moment, the state geologist stepped forward to mitigate the damage with other non-appropriated funds. The Governor’s capricious closure of the mining department and the mineral museum is an insult to the mining industry and to science education. She is also eliminating the popular earth science education programs at the top rated mineral museum. A new "Only in Arizona" contest is being promoted to herald the planned closing of the Arizona Mining and Mineral Museum -- one of America's finest natural resource museums. The last day is May 31. All exhibits will be dismantled, and then construction will start on the new "Arizona Centennial Museum" which will mark the centennial of Arizona statehood by opening sometime in the year following the centennial observances. The new museum will focus on the Five C’s of Arizona history: copper, cotton, cows, citrus and climate. The contest is to create the cleverest use of the 'Five C's' to lament the closing of the Mining and Mineral Museum. "Crazy, crazy, crazy, crazy, crazy" Rushton 5C contest is not suitable; it describes the decision to scrap the existing museum, it's too factual instead of being languorously lamentable. "Crazy clowns close cool cache" is along the line of what is wanted. "Clowns close cool cerussite cases" is another idea. "Copper, chalcopyrite, calcium carbonate, calcite"
"Corrupt clowns cancel clever crystals"
"Clever carvers cut crafty CaCO3"
"Clever crustaceans create cute coral"
These are mere suggestions. From silicon to silly cons, substantial suggestions are sought to save a precious element of Arizona’s heritage. The honors will be everlasting fame, gratitude, plentitude, fortitude and felicitudes to a real dude for help in opposing the arbitrary axing of one of America's finest museums. In March 2010, Representative Russ Jones and Senator John Nelson pushed through a bill transferring the top rated Arizona Mining and Mineral Museum and its’ K-12 education programs to the Arizona Historical Society. The AHS is scrapping the popular education programs and plans to scrap the mineral museum because they want to use the building for a new 5C Arizona Centennial Museum. The centennial museum, featuring the old history book 5Cs of Arizona, will include cotton and cows. The mineral museum is being destroyed even though funds for the centennial museum are not available. Only about 10% of the currently estimated cost of 15.5 million has been raised. Initially, the centennial museum was projected to cost $9 million and it was to be open for Arizona’s centennial. Now, even though work has not even started, the project is already 50% over budget and about a year behind schedule. Because the centennial museum can no longer be ready for Arizona’s centennial, it is being renamed. Planners are now calling it the Arizona Experience museum, and its theme is getting fuzzy. One thing is clear from the sole source, out of state contractor’s sketches. Virtually no trace of the mineral museum will remain. In pursuing these plans, the AHS is blatantly defying the law. In March 2010, the centennial museum bill was amended to preserve essential features of the mineral museum; the outdoor displays (mining equipment), the indoor mineral displays, and the K-12 education programs. However, the AHS sole source contractor’s sketches and their recent procurement documents still indicate the mineral museum will be obliterated. Past reports on the ASH prepared by the Arizona Auditor General show the AHS has a history of incompetence and corruption. Their Marley Center Museum project in Tempe was an absolute mess and drew extensive ridicule from the news media at the time. The 5C Arizona Centennial Museum, or the Arizona Experience museum, or whatever it is ultimately called, appears to be on the way to becoming a similar boondoggle. Incredibly, the AHS statute defying project is supported by a retired Arizona Supreme Court judge and the current Arizona Secretary of State. As president and vice president of the Arizona Centennial 2012 Foundation, they are responsible for the sole source contracts placed with centennial museum contractors. Even though funds are not available, the Foundation released a statement saying contractors have been placed. How these contracts could have been placed without adequate funds being available is unknown. The contracts are for work on a state owned building. If the sufficient funds are not raised and the Foundation defaults on the contracts, taxpayers will be responsible for any liens placed on the state owned building. A lot of people are willing to defy the law to deprive Arizona students of a lifetime learning experience. For over a year and a half, centennial museum planners and plotters have been working in secrecy. They knew that to have a successful boondoggle, you have to finish it before you are discovered. Unfortunately for them, sunlight is catching up with them before they even got a good start. They still do not have the money, and they have only a few architects’ sketches for plans. Several recent Arizona Republic and azcentral.com articles put some very unwelcome light on them. A very fair an balanced article by Rau and Pitzl revealed that they are way behind schedule and have only raised about 10% of the needed funds. Because the “centennial” museum can never open for the centennial anymore, they are struggling with changes to the name and the theme. They also have created determined opposition that recognizes the existing and top rated mineral museum they are destroying is far more valuable that the boondoggle they are trying to build. The concept is mushy and changing. The price is mushy and rising. This has all the makings of a boondoggle. Worse, we sacrifice a fine institution that is also and educational resource for teachers and school kids. How dumb is that? The centennial museum boondoggle had better hurry. Bad press is catching up with them. The Arizona legislature did not have the common sense required to kill this foolish venture when they had the chance, but an informed public will. Informed teachers and students will become outraged. Hundreds of thousands of parents and grandparents that fondly remember their class field trip to the mineral museum will not be abused with a 5C gang that is trying to cheat their children and grandchildren out of that experience. Time is running out for the 5C gang and their cherished sole source, east coast contractor. According to a 2010 revision to the Arizona statutes, the Arizona Historical Society is responsible for the 5C Arizona Centennial Museum. In the Governor’s February 12, 2010 press release, she said, “This facility will feature educational profiles of each industry, showcasing the rich heritage of Arizona’s economy and providing a vision of its brilliant future.” In a recent (Mar 20, 2012) Arizona Republic article, Karen Churchard said “the new museum will “ tell the story of Arizona’s economic past and future … this is the governor’s vision and I think it is a great one.” Karen Churchard is the director of the Arizona Centennial 2012 Foundation which is placing the sole source contracts to build the centennial museum. Now, the Governor chose the AHS to maintain and operate the centennial museum. Just exactly how did she determine that the historical society was the best agency to manage a facility predicting Arizona’s future? A fortune telling historical society is an oxymoron. She could have thrown the yellow pages down the elevator shaft and torn off the first open page to find a better qualified organization to foresee the future. The fluff being added to the centennial museum also makes the AHS uniquely unqualified to operate it. Stung by criticism of the banality of the 5Cs as a museum theme, the Governor’s office began adding all sorts of high tech gizmos from robots to spacecraft. Just how is the AHS going to plan, prepare, and maintain displays explaining high tech industries? The choice of the AHS for that task is ludicrous. Perhaps the AHS should ask a real psychic about the future of the 5C Arizona Centennial Museum. Specifically, they should ask her if a new $15.5 million (so far) museum that repeats the mistakes of the Marley Center Museum can be successful. Arizona taxpayers should also consult a psychic. They should ask how much the cost overrun on the centennial museum will exceed the cost overrun on Marley Center. Is Governor Brewer’s vision an illusion or a delusion? In a recent article, the Arizona Republic reported that the Governor’s pet project has hit some snags. No one is interested in contributing to a $15.5 million centennial museum that can never be open for the centennial, and mineral museum supporters are fighting the project “every step of the way.” Karen Churchard, director of the AZ Centennial 2012 Foundation, said they have raised $1.7 million of the needed $15.5 million. As dismal as that is, it is probably an exaggeration. She is probably including federal stimulus money. If that is true, the governor is breaking the promise, made in her Februarys 2010 press release, that “no public funds” would be used. Churchard went on to say “I totally understand that change is hard, but this is the governor’s vision and I think it is a good one. When it’s finished, this is going to be a really unique way for our children to learn about our state.” First, the phrase “change is hard” is an insult to Arizonians. It implies that only Churchard and the governor possess the vision and intellect required to appreciate a 5C museum. Second, a 5C museum would truly be unique. Citrus, cotton, and cattle account for less than a fraction of one percent of the Arizona economy, but their displays would occupy 60% of the main floor. That is a uniquely irrelevant and distorted way for children to learn about their state. The Governor’s “vision” is both an illusion and a delusion. She is not properly seeing the destruction of the mineral museum and its K-12 earth science education programs, and she has mistaken beliefs about the value of and interest in a 5C Arizona Centennial Museum. The failure of the fundraising effort made a clear statement. Refusing to see it, the Governor simply renamed the ‘centennial museum” the “Arizona Experience” and continues to pretend that her vision (illusion) will become reality. 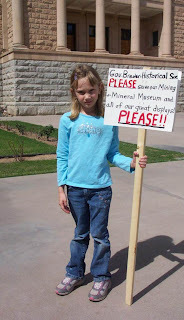 From the beginning, she absolutely refused to see the engineering and scientific value of the mineral museum and its self-funding K-12 education programs. She is under the illusion that a 5C museum has more educational value that an earth science museum and she is under the delusion that Arizonians will appreciate an “Arizona Experience” museum if she can just extract enough money from somewhere to build it. Furthermore, she is under the delusion that if Arizonians did want another Arizona history museum, they would want one built by a sole source east coast contractor. She is also under the delusion that the Arizona Historical Society, with a failed $30 million Marley Center Museum, can successfully operate a similar Arizona Experience Museum. Unfortunately, the Governor lacks the knowledge to properly perceive the tradeoff between an existing top rated mineral museum and a proposed $15.5 million 5C museum (virtual repeat of Marley Center Museum mistake). She is also confused by her belief that her vision is what Arizona wants. Note: Taxpayers are still supporting the failed Marley Center Museum. Last year, it cost them over $3,000,000. The number one “signature” project of the Arizona Centennial Foundation is the 5C Arizona Centennial Museum featuring cotton and cows. However, it has recently been renamed the Arizona Experience museum because it can never be open for Arizona’s Centennial. It is a year behind schedule and 50% over budget. Nevertheless, the Arizona Mining and Mineral Museum is being closed June 1st because the Centennial Foundation plans to use the same building for the centennial / experience museum. The Foundation will not answer phone calls or letters. No one knows what will happen to the irreplaceable mineral collection or the historic mining equipment. Harrison and Naomi are unhappy. They love the mineral museum and cannot understand why the Arizona Centennial Foundation and the Arizona Historical Society want to destroy the top rated mineral museum and its K-12 earth science education programs. Harrison likes to look at the fluorescent mineral display. The rocks and minerals radiate many beautiful colors as they are energized with ultraviolet light. He also likes the precious metal displays featuring gold, silver and platinum, and the beautiful gemstone displays featuring tourmaline and beryl. Special favorites are the awesome orange and yellow wulfenite crystals collected in Arizona’s old lead mines. Arizona is world famous for these wulfenite crystals, and they cannot be replaced. They came from rich and historic underground ore veins that no longer exist. Naomi likes the old baby gauge steam locomotive that hauled copper ore in Morenci long before Arizona was a state. She hopes the historical society does not scrap it. She also enjoys the interactive micro mount display. Each time she pushes the big button, a new miniature crystal specimen is positioned under a microscope. A camera displays the crystal on a large monitor where it becomes hundreds of times larger. This beautiful crystal display is her favorite. In a by invitation only event in February 2010, Governor Brewer proudly presented her birthday gift to Arizona: the 5C Arizona Centennial Museum. She promised no public money would be used. During the past year, the smell of this “gift” has gotten worse and worse. Not only will this “gift’ actually cost taxpayers millions, it is also displacing the top rated Arizona Mining and Mineral Museum and its very popular K-12 earth science education programs. In spite of numerous complaints to the Governor’s office and to the Legislature, the Governor persists in trying to build this pet project featuring the social aspects of cotton and cows. On March 15, students and mineral museum supporters protested the upcoming June 1st closure of the mineral museum on the Capitol mall. The Governor had an appearance scheduled with Chamber of Commerce representatives who were assembled on the Senate lawn. Rather the walk from her office to the Senate lawn and have to cross the Capitol mall, the Governor took her car from her office to the street in front of the Senate lawn. Therefore, the protestors reassembled on the sidewalk between the Governors car. When the Governor completed her appearance at the Chamber of Commerce event, she was forced to cross the line of protestors. The Governor slunk through the protest line without looking at or speaking to anyone. 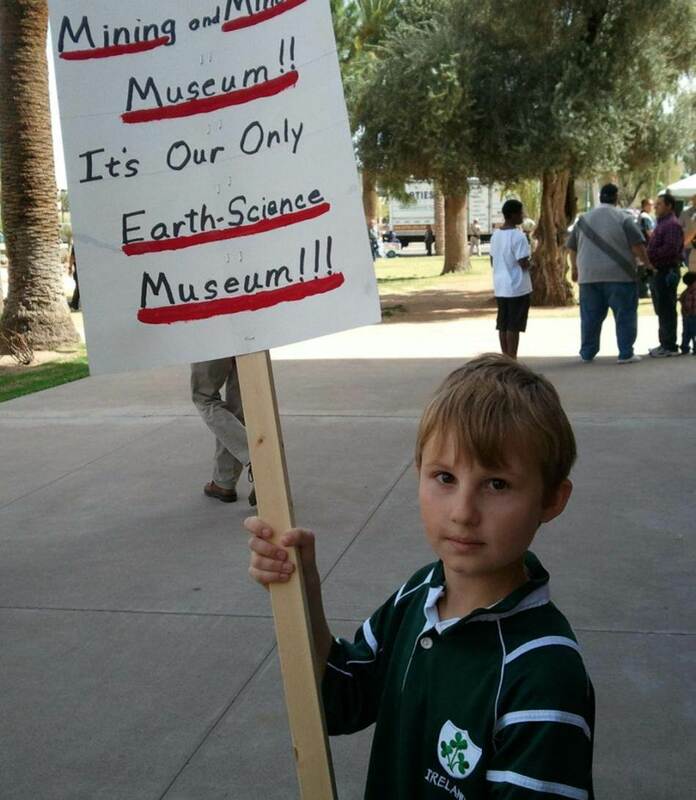 Perhaps she feared a six year old might ask her why she is so determined to deprive them of their favorite museum and Arizona of its only earth science museum. Is the Arizona Historical Society rewriting Arizona history? The motto of the Arizona Historical Society is: “Saving Arizona’s history since 1864”. That may soon have to be revised to read: “Saved Arizona’s history from 1864 to 2009.” That’s because the AHS now appears to be rewriting Arizona history. The AHS is planning the 5C Arizona Centennial Museum (now AKA the Arizona Experience museum). Since they choose a sole source out of state contractor, and because they are a state agency, they could not place the procurement themselves. Therefore, the procurement is being placed for them by the Arizona Centennial 2012 Foundation. That is an Arizona corporation formed by state and quasi state employees that operates out of the Office of Tourism, another state agency. Last year, Governor Jan Brewer announced plans to enhance and transform the current Arizona Mining and Mineral Museum, located at 15th Avenue and Washington Street in Phoenix, into The Arizona Experience Museum, a highly interactive, technology-driven museum showcasing Arizona’s past, present and future. This new Centennial Museum will be a vibrant, interactive facility, offering state-of-the-art technology and exhibits unlike any in Arizona,” said Governor Brewer. This facility will feature educational profiles of each industry, showcasing the rich heritage of Arizona’s economy and providing a vision of its brilliant future. -------- Arizona’s story of economic advancement will be told through the “Five Cs” (Copper, Cattle, Citrus, Climate and Cotton) of our state’s industrial heritage. Interactive displays will highlight these key industries allowing the Arizona story to unfold. Each of these displays will bring to light how these prime industries continually bring prosperity and contribute to Arizona’s economic health and vitality. ………….. The Arizona Centennial Commission, the Arizona Centennial 2010 Foundation, the Arizona Historical Society and representatives from the “Five Cs” are working collaboratively to collect the necessary private sector funds to renovate and maintain the museum. In fact, House Bill 2251 (2010) that revised Arizona statutes to include the centennial museum specifically specified that it is to be the “5C Arizona Centennial Museum.” The recent statement put out by the foundation is nearly a complete rewrite of the Governor’s statements. It is certainly not a paraphrase. Someone tried to completely change the words that came out of the Governors mouth. Since the Foundation is simply helping with an AHS project, the AHS is responsible for this statement. According to the statutes, the “5C Arizona Centennial Museum” is solely an AHS responsibility. The Foundation has no authority to raise funds for it or to build it unless so authorized by the AHS. Likewise, the AHS has no authority to change its name or to change its theme. These changes are a misrepresentation of what he Governor said, and they are also a violation of Arizona state statutes. The sole source out to state contractor’s design sketches show almost no trace of the exiting top rated Arizona Mining and Mineral Museum. That is another violation of state statutes. HB 2251 (which the Governor signed) clearly stated that the existing Arizona Mining and Mineral Museum would be “housed” within the 5C Arizona Centennial Museum. The new museum and the old museum were clearly supposed to share the same building. The AHS and the Centennial 2012 Foundation are now throwing the mineral museum out and using all the floor space for the Arizona Experience Museum. Perhaps the AHS will eventually be reenacting history as well as rewriting it. Perhaps they will all be housed in the old Yuma Territorial Prison. Note: The sole source contractor is the same one used by AHS for their failed Rio Nuevo project in Tucson. There, the AHS spent $1.4 million tax dollars designing a museum that will never be built. The Arizona Centennial Foundation is an Arizona corporation established by mostly government and quasi government people. Quasi government people include retired government workers, lobbyists, etc.). The Foundation operates out of the Arizona Office of Tourism, and that office’s address is listed as the Foundations address with the corporation commission. The Foundation is being used to avoid state procurement procedures and thereby permit sole source procurements. The Foundation has been attempting to raise funds for projects intended to celebrate Arizona’s centennial. Their “signature” project is the 5C Arizona Centennial Museum. Because the initial fund raising effort failed, that project is at least a year behind schedule and can never be open for Arizona’s centennial. Therefore, the Foundation has renamed it the Arizonan Experience Museum. The major problem with the centennial (experience) museum is that it completely displaces the top rated Arizona Mining and Mineral Museum and its K-12 earth science education programs. The “theme” of the centennial (experience) museum is the 5Cs of Arizona. That simplistic mnemonic device has been used for decades by Arizona history teachers to remind students that cattle, cotton, copper, citrus, and climate once contributed to Arizona’s economy. Today, however, cattle, cotton, and citrus combined make up less that ¼ % of Arizona’s economy. The educational value of a 5C museum is minimal. Stung by criticism of the irrelevance of 5Cs when the museum was first announced a year ago, the Foundation has fluffed it up to include “technology, bioscience, mining, green industries, renewable energy, aerospace, sports and recreation, agribusiness and other emerging opportunities and growing industries” (yes, mining and agribusiness are redundant to the 5Cs, but those are the Foundation’s words). Given the size of the building, all these new promises make no sense. Since the 5Cs will reportedly occupy the entire first floor and everything else will be in the mezzanine, they are especially ridiculous. Allowing their non-technical, sole source, out of state contractor to redesign the mineral exhibits will destroy their educational value. The contractor’s design questionnaire only addressed the social and economic aspects of mining, clearly demonstrating complete ignorance of the existing technical and scientific context and interpretation of the existing displays. The Foundation’s non-technical contractor will destroy the mineral museums educational programs. School busses will no longer arrive daily if the mineral museum is converted into the “experience” museum. If the Foundation is allowed to continue, the museum will indeed be “transformed” as the foundation says, but not in a positive way. 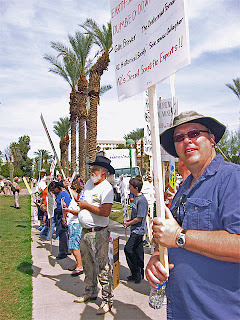 Management by the non-technical Arizona Historical Society will make the situation even worse. Please do not contribute to the Arizona Centennial 2012 Foundation. Funds they may acquire will be used to destroy the top rated Arizona Mining and Mineral Museum and its K-12 earth science education programs. Arizona’s future (and taxpayers) will suffer. CAGW's mission is to eliminate waste, fraud, abuse and mismanagement in the federal government. CAGW's most famous publication is the annual Congressional Pig Book Summary, an exposé that names pork-barrel politicians and their pet projects. Periodically, CAGW also publishes piglet books on waste in state government. Lawmakers looking for places to trim state government shouldn’t have to look hard. Even after nominal cutbacks to the state budget over the past two years, state government is still packed with wasteful spending and questionable programs. Centennial spending doesn’t end with local projects. The state government established a pricey and seemingly unnecessary museum to celebrate the state’s impending centennial. The 2011 state budget gives the Arizona Historical Society $589,700 so it can take over the existing Arizona Mining and mineral Museum and make it part of the new Arizona Centennial Museum. The state’s new Centennial Museum isn’t the only museum on the dole. In fact, it is not even the most expensive. The Museum at Papago Park costs the state taxpayers six times more to subsidize than the Centennial Museum. Taxpayers will pay $3.2 million to keep the doors of the Tempe-based museum open in 2011. Even in the midst of a severe financial crisis, the Arizona legislature is not capable of screening out funding for pork projects. The 5C Arizona Centennial Museum is certainly not essential, and it will likely fail for many of the same reasons that big Arizona Historical Society projects have failed in the past (example: Marley Center Museum). In her February 12, 2010 press release, the Governor promised that “no public funds” would be used for her “birthday gift” to Arizona. However, now that the fund drive has failed, public money is being diverted to the faltering project. One example is Senate Bill 1262, which transfers special centennial license plate funds to the Arizona Historical Society specifically for the centennial museum. Just as the legislature rubber stamped the unfortunate centennial museum bill itself (see Oct 1, 2010 post “58 Geese voted - - -”), the house and senate are rubber stamping SB 1262. In spite of being briefed on the serious centennial museum problems (video available on www.az.gov), the Senate Natural Resources Committee (John Nelson, chairman) unanimously passed the bill. It was then passed by the entire senate without any meaningful amendment. Now it is in the House. The first reading was on February 28 and the second reading was on March 1st. The committee hearing will come soon with very short notice. After that, the entire house will rubber stamp it, probably without either reading it or discussing it. The unaltered progress of SB 1262 is extremely unfortunate. A special license plate to celebrate Arizona’s centennial is fine, and it could have been a wonderful opportunity to do good. Funds could have been used to keep rest stops or state parks open or applied to some other worthy cause. Instead, they will support a failing boondoggle. Taxpayers can express opposition to this waste of money online. Properly entered comments will be read in the committee hearing prior to the vote. Few of the irresponsible representatives are likely to listen, but at least they will have the opportunity to do so. To express your opposition, go to www.az.gov, and then click on “legislative branch” and “request to speak”. Follow the directions to establish an account and then to enter you comment about SB 1262. You can also find the information needed to comment by email, snail mail, or fax on www.az.gov. However, you have no assurance that your comments will be read by anyone. Comments posted on “request to speak” will at least be read aloud before the committee vote. 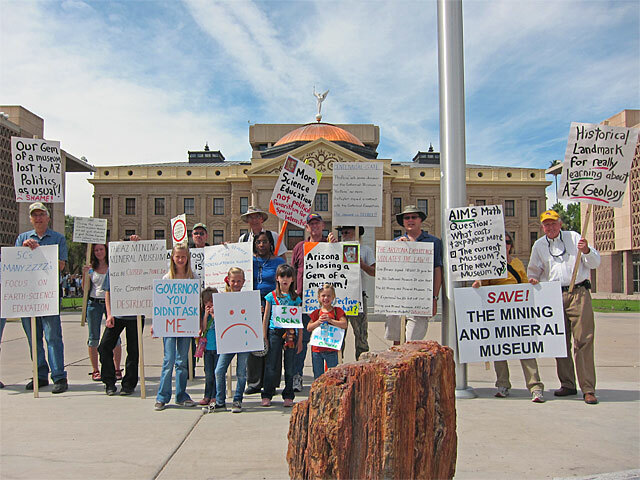 Why is a mining company undermining Arizona’s Mining and Mineral Museum? The website for the Arizona Centennial 2012 Foundation ( http://www.arizona100.org/) shows one “major contributor”. That is Freeport McMoRan Copper and Gold. Their logo is prominently displayed on the Foundation’s website, and they are also the only major contributor identified. That presents the greatest mystery of the near secret 5C Arizona Centennial Museum boondoggle. Why is, of all things, a mining company supporting it? The centennial museum will completely displace the existing top rated mining and mineral museum and its K-12 education programs. The existing mineral museum displays the history, the technology, and the products of the copper industry. It supports the mining industry by inspiring and educating future geologists and mining engineers. The sole source contractor’s questionnaire for the new centennial museum revealed that it will only present the social aspects of the mining industry. On the surface, replacing the technology focused mineral museum with the socially focused centennial museum is a major loss for Freeport. So why are they so willing to provide a million dollars of financial support for the centennial museum? Freeport’s lobbyist was initially very active in promoting the centennial museum legislation that is now destroying the mineral museum. Other industries representing the 5Cs (cattle, cotton, and citrus) eventually recognized that the centennial museum is a very bad idea and backed out of the industry collation that was supposedly going to fund it. Yet Freeport continues to support it for no obvious reason. They are the major financial contributor, and their lobbyist is a board member on the Arizona Centennial 2012 Foundation. Obviously, there has to be a reason, but it appears to have nothing to do with the public promotion of Freeport’s industry or products and nothing to do with training future employees. Until recently, Freeport was a major supporter of the mineral museum. Suddenly, they appear eager to sacrifice, and even support the destruction of, the mineral museum. There must be something much more important that they want. The Arizona Mining and Mineral Museum commemorates the mining industry that helped build Arizona. Arizona is the Nation's number one mining state with the largest value of non-fuel mineral production in the country. The Arizona Mining and Mineral Museum can trace its origin back to the first Arizona Fair, held in November of 1884! The mineral display was said to "overshadow all else." The collection, already one of the finest in the world, has been growing and improving since that time. To educate Arizona's citizens about our mining and mineral heritage and to demonstrate that minerals are the cornerstone of Mankind's existence; that minerals have aesthetic value; and, that minerals have functional value. That sounds quite impressive. Why no mentions of it becoming even better? Why is there no information about how the mineral museum is going to be “enhanced” with cotton and cows? Why absolutely no mention of the $10 million plus 5C Arizona Centennial Museum that is going to replace it? There is nothing on the website about the centennial museum other than perhaps the word “centennial” that was tacked onto the name. There have been no press releases about the centennial museum since the Governor’s original one over a year ago. There has never been any kind of a public announcement by the AHS. The Arizona Centennial Commission used to have the centennial museum on their website as their “number one signature project”, but that has disappeared. Neither the AHS nor the centennial commission will answer questions about the centennial museum. Even the fund drive has not been publicized. Exactly how do you raise money in secret? Why the secrecy? Is the AHS afraid to promote their $10 million plus new wonder of Arizona? Are they afraid that they will be subjected to extensive media ridicule as they were when they built the failed Marley Center Museum (Tempe)? Are they afraid it will fail before it is built, like their History Museum at Rio Nuevo (Tucson)? Are they afraid the public will be enraged over millions spent on another non essential history museum in the midst of a financial crisis? Are they afraid Arizonians will resent their sole source out of state contractor? Are they afraid there will be a public outcry over the loss of K-12 science education programs? Are they afraid that public will become aware of their relatively large staff and $6 million taxpayer subsidy? Whatever the reasons, the centennial museum began is secrecy (reinforced with gag orders) and continues in secrecy. It is time for the “enhancement” of the historic and top rated mineral museum to be brought into the sunlight.